I, the Designer, Luke Bulei come from Buyang in the Tetidu Electorate. I was born on Koronat Island in 1963 and I am now married with two children. I did my primary education at Worei Community School and my secondary education at Manus High School. I then proceeded to do grades 11 & 12 at Kerevat National High School in Rabaul. From Kerevat, I decided to become an aircraft engineer. Accordingly I applied for an aircraft engineering course at Port Moresby Technical College. On the completion of the course I was selected to do my four years' Apprenticeship with the Missionary Aviation Fellowship in Mt Hagen. I completed my apprenticeship in 1990 and then started working with the MAF. I left the employ with MAF in 1994 and started work with our National Carrier, Air Niugini in Port Moresby. Many of our people have interpreted the flag and the symbols in it wrongly, either intentionally or because of misunderstanding. In 1977, Worei Community School was informed of the Manus Provincial Flag Design Competition. With limited resources and assistance, I decided to take part in what was to represent the people of Manus later. At the time I was working on the entry, the symbols and colours had specific meanings. The colour brown represents the inland people and the blue represents the island people. The Chauka is only found in the Manus province. 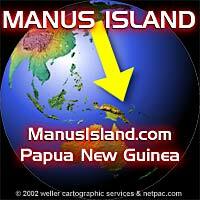 It is not found in any other place in PNG. My second reason for selecting the chauka is that it heralds the coming of dawn and signals the going down of the sun. Thirdly the chauka often warns us of dangers. Fourthly it informs us whether the hunting trip will be successful or not. And of course the NBC Radio Station in Manus had become Maus Bilong Chauka several years before. The other important symbol on the Manus Flag is the green snail. Like the Chauka, the green snail is unique to the Manus province. The results were later announced through Radio Manus, Maus Bilong Chauka and my design was chosen to represent the people of Manus. Though nervous at first after being notified of the result, I was proud not because I won the competition but because the symbols and the colours I chose for the flag are the true representation of our people of Manus. I honestly believe that today many of our people in Manus have misinterpreted the symbols on the flag I designed 22 years ago. And for me as the flag designer, I think this is bad. Personally I will continue to salute the flag of Manus with respect and dignity because the symbols and the colours on it have represented our people in the past, are representing us today and will represent us and many generations to come tomorrow and beyond.